As promised, on Friday, I tried the mask which came with the January 2013 Glossybox so that I could have this review ready for Sunday. One is the Peptide Transformation Serum the other the Thermal Rose Clay Mask. Reveal smoother, glowing, more youthful skin with our 30 day Thermal Transformation Mask. The special peptide and hyaluronic acid contained in this treatment have been shown to strengthen the collagen network to plump and repair skin’s structures, as well as giving a tauter surface to reduce any ‘crepey’ skin. When combined with powerful natural extracts that provide a hydration surge, the treatment leaves skin feeling firmer and looking smoother and refined, with a visible reduction in the appearance of wrinkles. 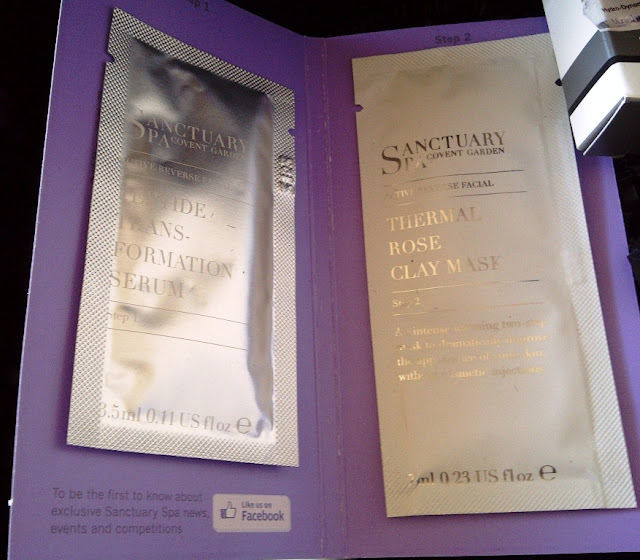 The Thermal Transformation Mask begins with the Peptide Transformation Serum, followed by the Thermal Rose Clay Mask. An intensely warming effect helps optimise the action of the encapsulated enzyme to deeply cleanse & refine the skin surface. After 4 weeks the two step mask visibly firms and refines to reveal an even skin tone and to minimise the appearance of fine lines and wrinkles. Encouraging cell-renewal and boosting hydration levels, means that when the mask is washed away, your complexion has a glowing, dewy finish. As mentioned in the Glossybox review the product did promise instant results after one use of skin looking brighter & tauter and noticeably reducing 'crepey' skin. The sachets provided only one use. I liked the ritual of cleansing, applying the serum (which I was surprised to find was a thick cream) and following this with the clay mask over the top of it. I loved the feeling of the warming sensation but to my intense disappointment this didn't last long at all. I sat back and relaxed for 15 minutes whilst reading a book, waiting for the magic to do its work. Scent wise this has a slight herbal smell and the rose clay mask has a very subtle rose scent, very pleasant to use and apply. Once I had rinsed off the mask, my face felt so soft and actually I am very pleased to report that my skin looked incredibly smooth (fine line free) and plumped. This works! I would actually be very interested in trying a full size product as the effect was visible to see and I want to know if it lasts..
Really looking forward to trying this one - was one of my instant favourites from the January box so it's next on my list to try at home.